Enriched Wheat Flour, Cheddar Cheese [(Pasturized Milk, Cheese Culture, Salt, Enzymes), Water, Salt], Shortening (Canola, Soybean, Cottonseed and/or Sunflower Oils) contains 2 percent or less of: salt, yeast, sugar, yeast extract, leavening (Sodium Bicarbonate, Monocalcium Phosphate), spices, Annato (colour) and onion powder. 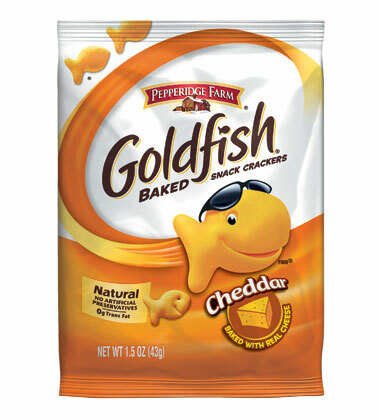 Goldfish shaped, cheese flavoured snack crackers. Baked, not fried, made with real cheese. No preparation or cooking required. Do not re-freeze. Do not use if film is torn or missing. Do not hold refrigerated product longer than 2 days. Serve anywhere you would serve crackers.